One of the most important undertakings we can do for the environment is to recycle materials for the future in a different format. As a textile artist we have many scraps of material and thread that can have a secondary use. In this quilt I have recycled many of the pieces of hand-dyed silk that are remnants from previous projects. Not only have I found a use for these pieces but I have saved a small part of the environment by not having to hand dye material for future use. The scraps of fabric were fused to batting and held down by a layer of tulle over which I machine quilted in a spiral. The tulle was slashed to show the material underneath. Recycled sari ribbon was twisted into a cord and hand stitched around the spiral. 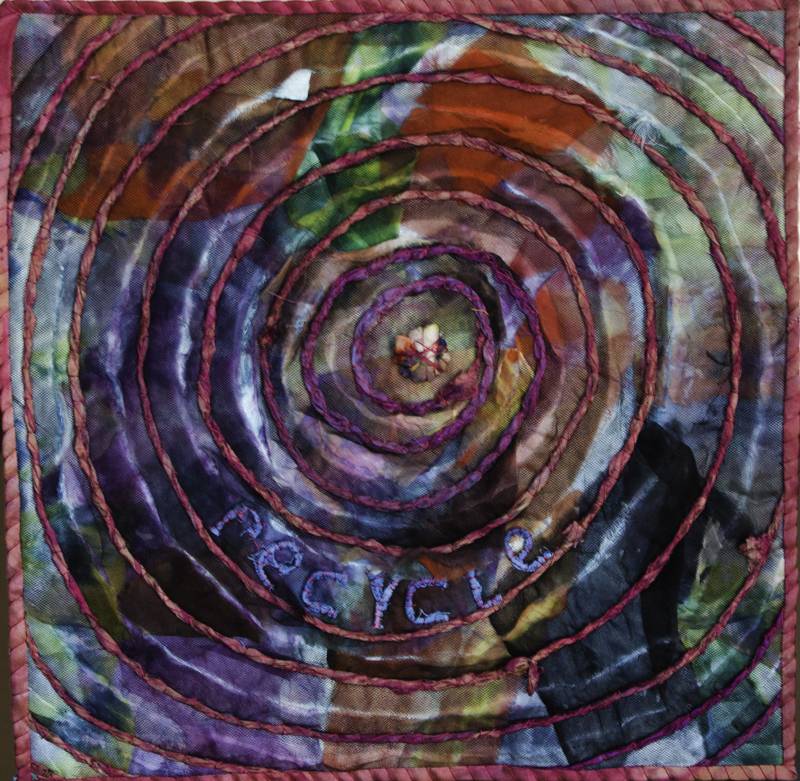 The word “Recycle” was from twisted silk, while the center of the spiral is a small bundle of fabric bound with thread. A very original piece, love the colours. Beautiful colors. I love the sari ribbon cord. I love the spiral in your quilt. It’s eye-catching. I love the background and how we see the fabric underneath where the tulle has been slashed. Love the colours too !